Every year, there is an increasing need to understand and take action against the threat of chemical, biological, radiological, and nuclear weapons. This year, IB Consultancy and the CBRNe Society are resolute in our mission to be at the forefront of this challenge. One of the main priorities for this year is to carry forward our mission to create opportunities for leaders in the CBRNe community to share his/her experience and expertise with other individuals, high-level decision-makers, industry experts, civil and military first responders, dealing with CBRNe security and defense capabilities. Our first opportunity to bring CBRNe stakeholders together is the 2nd edition of NCT South America, which will take place in Rio de Janeiro, Brazil from the 5th to the 7th of February, 2019. This event will be hosted in partnership with the Brazilian Ministry of Defence. The conference will be enhanced by a Live CBRNe capability demonstration and by an expo tour to showcase novel solutions in response to ever-evolving CBRNe threats, as well as entertainment for all our delegates to network with one another after the conference stream has ended. There is a lot that the region and the world can learn from Brazil’s cooperation with its regional partners, showcased by the radiological Cs-137 Accident in the Goiânia region and their preparation for HVEs such as the 2014 FIFA World Cup and the 2016 Summer Olympics. 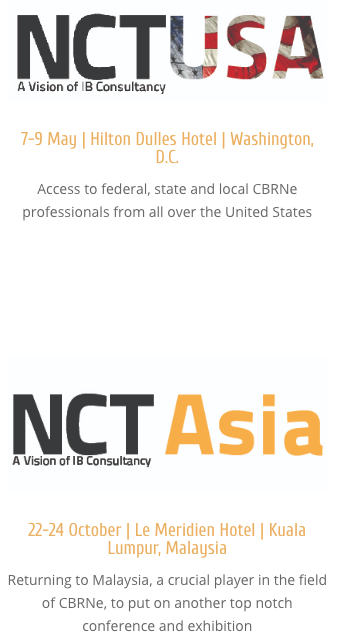 IB Consultancy and the CBRNe Society will then move to North America for the 5th edition of NCT USA, held in Washington, D.C. from the 7th-9th of May. We are partnering with the Fairfax County Fire and Rescue Department’s HazMat Response Team, which ensures that this event welcomes the best and most experienced in the field of CBRNe. Next to our conference, industry showcase, and famous BBQ, we will be hosting the 3rd edition of the multi-agency, international NCT PRO Trainings for teams of professional first-responders to answer to a real-life CBRNe, C-IED/EOD scenario. The 8th edition of NCT Europe will take place in Vienna at the Museumsquartier from June 25th to the 27th in partnership with the Austrian Ministry of Defense and the Austrian Armed Forces. Austria, which is geographically located at the crossroad between Eastern and Western Europe, is the perfect location for a regional event in which delegates from around the world will be able to talk about regional and international CBRNe threats. The event will include the traditional NCT Welcome Party, the NCT Expo Tour, and live capability demonstration. 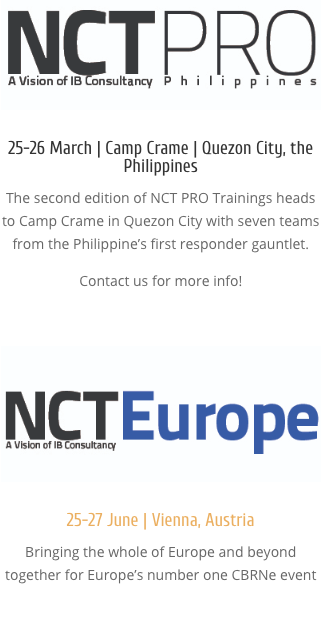 The 4th edition of the intra-agency and international NCT Pro Trainings will also take place during NCT Europe to increase the interoperability between European and international civil and military first responders; each of the teams participating in the Pro Trainings will benefit from using the newest, state-of-the-art equipment provided by the event's industry sponsors. The IB Consultancy and CBRNe Society teams look forward to welcoming delegates and exhibitors to the conferences we will be hosting this year. If you would like to attend our events, visit our website for an overview of this year's events schedule. To check out the pictures and videos of all of our 2018 events, you can visit IB Consultancy’s Facebook or Vimeo Page.